Use this as a dressing for some lovely fresh vegetables from the garden. It is a guaranteed way to add some seasonal herby freshness all year round. 1. Peel and chop the garlic. If making in a large pestle and mortar then add the garlic and salt and pound to a paste. If making in a food processor then add the garlic, salt and nuts and process to a coarse lumpy crumb. 2. If using a pestle and mortar then add the pine nuts next and smash them to a coarse crumb. 3. Cut the herbs roughly, using a large knife and add all together to the food processor with the oil and lemon and then process to a coarse puree. Taste for vinegar/lemon and salt and adjust as necessary. 4. 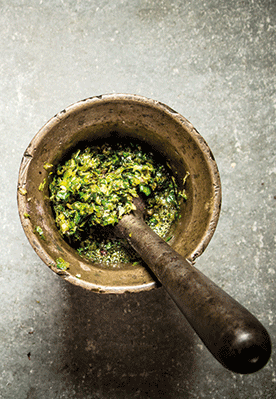 If using the pestle and mortar, cut the herbs roughly and add them, a little at a time, to the mortar, grinding it to a paste before adding the next leaves. If it starts to get to thick, add a little oil to loosen the process. Once they are all incorporated, add any remaining oil and the vinegar/lemon and taste for seasoning. Put into a small container or jar and store in the fridge for months if needed.